Posted 25 July 2015 in According To Kirby. Michael Hill sent us this article, as well the Interviews piece we published last month, for consideration for The Kirby Effect. We’re publishing it here in three parts with comments disabled – Rand. With thanks to Steven Brower. We don’t know. We weren’t there. It would be an exaggeration to credit Kirby with full authorship of his work at Marvel… Lee’s presence was sustaining, generative, and overwhelming; his verbal swagger and editorial cunning were definitive to Marvel, and documentary evidence suggests he was, early on, both Kirby’s guide and active collaborator in envisioning such properties as The Fantastic Four. …in a sometimes-volcanic interview given to The Comics Journal in 1989, Kirby… disputed Lee’s share of creative contribution to the early Marvels, claiming sole authorship… “I used to write the stories just like I always did,” he said. The Accepted Version is so thoroughly supported that even a lauded work of Kirby scholarship and a long-running Kirby publication embrace Lee’s version and dispute Kirby’s. Jack Kirby spoke very clearly on all of these issues. When asked specifically about Lee’s first-issue synopsis, he said, “I’ve never seen it, and of course I would say that’s an outright lie.” 4 He denied ever working from a Lee script. After their 1968 purchase of Marvel, it would have been in the interests of Perfect Film & Chemical to minimize the contributions of a freelance creator. It was particularly important in Kirby’s case because Marvel had no contract, not even a paycheck, to document his working relationship with the company. 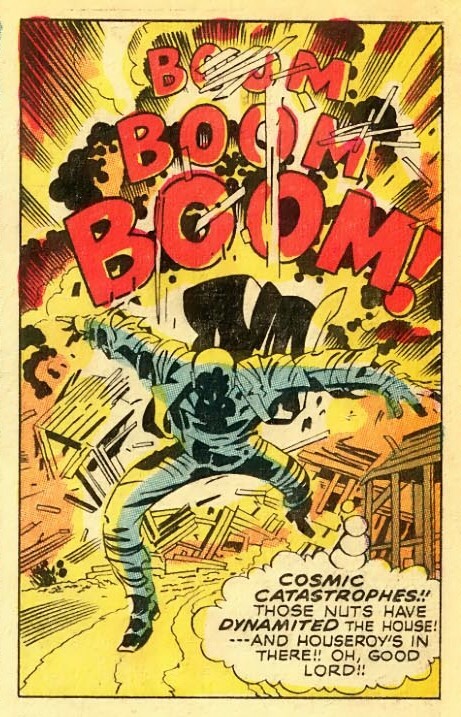 In 1974, Lee’s Origins of Marvel Comics 6 committed Marvel’s authorized version of events to book form. On numerous occasions in the ’70s and ’80s, Kirby spoke frankly describing his creative contributions (see the “Interviews” post). Rather than being permitted to set the record straight, he was attacked. Special acrimony was reserved for his 1989 interview, despite the fact that Kirby had made the same claims in many interviews for over twenty years. 1963 Steve created Doctor Strange. 1966 Jack created the Surfer. 1968 Jack created Ego… he needed no plot at all. I created the Inhumans. 1969 I created the Hulk, too, and saw him as a kind of handsome Frankenstein. 1970 I was faced with the frustration of having to come up with new ideas and then having them taken from me. 1971 I’d tell Stan Lee what the next story was going to be, and I’d go home and do it. I created the Silver Surfer, Galactus and an army of other characters, and now my connection with them is lost. 1974 I must have gone through a dozen pencils and a thousand sheets of paper in the days that followed… But I kept coming back to the same ludicrous idea: the only way to top the others would be with Super-God. I created the FF, the Hulk, Spider-Man, Thor, Doctor Strange. 1982 The ideas were cooked up by me! 1986 All the concepts were mine. I wrote the script and I drew the story. 1987 The Marvel outfit will give credit to nobody except Stanley, see? 1989 I wrote everything I did. When I went back to Marvel, I began to create the new stuff. 1990 I wrote the complete story. I drew the complete story. 1998 Jack tended toward hyperbole. 2010 I tried to write them to make it look as if he and I were just doing everything together, to make him feel good. I created Spider-Man, the Hulk, Iron Man, Thor, Daredevil, the X-Men, Nick Fury, the Avengers, Ant-Man/Giant Man, and the Rawhide Kid. We’ve lost sight of what we once knew about Stan Lee. 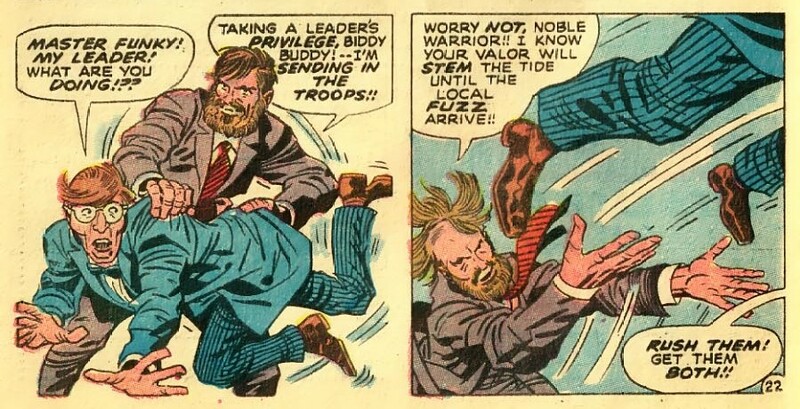 Mid- and late-1960s satirical swipes in Sick magazine and DC’s Angel and the Ape presaged Kirby’s own Funky Flashman, painting Lee as the guy who signed his name to other people’s work. In the early ’60s he confided to Jerry Bails that Doctor Strange was Ditko’s creation (he later recanted in Origins). In 1986, Bails was under no illusions when he said, “Kirby should be advised to sign on the biggest legal guns and fight for the characters he created.” 8 It’s Lee who has charmed us into believing that Jack Kirby is a liar, and we’re convinced of it even while trying to work out when Stan Lee last told the truth. The TCJ interview still draws fire, much of it from people who haven’t read it. The condemnation is mystifying, since there are dozens of earlier Kirby interviews ready to rise up to take its place, dating back to 1968. Meeting with Gary Groth in the summer of 1989 was not the first time Jack Kirby had been given the opportunity to dispute Lee’s widely-believed creation story: Kirby had been telling the same version for twenty years (see the “Interviews” post). When Stan Lee speaks, his “recollections” are treated as history. Many of Lee’s pronouncements have proven to be false with no obvious effect on his credibility; Kirby has been labeled a liar simply because his story is at odds with what Lee says. What would it look like if we treated Jack Kirby’s account with the same reverence and awe given Lee’s? What if we were to give more scrutiny to Lee’s version, along with the accounts and motivations of those who corroborate it? In 1998, Roy Thomas cautioned against putting stock in “Stan’s memory or Jack’s memory.” 9 Since he was one of the advocates of Lee’s version, Thomas was referring specifically to the old man memories Jack Kirby had shared with Gary Groth. Three decades earlier, Kirby and Lee were both interviewed for print; only one of them told a story that wouldn’t change. In 1968, Kirby and Lee were in the midst of their professional relationship. Lee was hampered by his own credit boxes: he couldn’t say the “artists” were doing the plotting—it might come back to bite him in the wallet; he couldn’t reveal that, for more than a year, he’d had no inkling of what Steve Ditko was going to put in the next Spider-Man; he couldn’t admit that he never provided Jack Kirby with a plot. On the other hand, Kirby’s wording was only tempered by his employment situation. STAN: Some artists, of course, need a more detailed plot than others. Some artists, such as Jack Kirby, need no plot at all. I mean I’ll just say to Jack, “Let’s let the next villain be Dr. Doom”… or I may not even say that. He may tell me. And then he goes home and does it. He’s so good at plots, I’m sure he’s a thousand times better than I. He just about makes up the plots for these stories. All I do is a little editing… I may tell him that he’s gone too far in one direction or another. Of course, occasionally I’ll give him a plot, but we’re practically both the writers on the things. Q: Who created the Inhumans, you or Stan Lee? Q: Do you plot the Fantastic Four stories by drawing the basic story and then having Stan write the dialogue? NC: Well, I can remember trembling with anticipation waiting for the next Thor during the period when you had Id, the Living Planet, or Ego, the Living Planet I think that was it. SL: Yeah. That was Jack’s idea too. I remember I said, “You’ve got to be kidding.” He said, “No, let’s get a living planet, a bioverse.” Well, I didn’t want him to think I was chicken. I said, “All right, you draw it, I’ll write it.” And, yeah, I think it turned out pretty good. The year after the Excelsior interview, Kirby was still in Marvel’s employ when he told Mark Hebert what he was thinking when he created The Hulk. Roy Thomas should be pleased to learn that Kirby didn’t let his memories of uncredited work get old before getting them published, but did so while the memories were still fresh, still being made. JACK: NO! It hasn’t obscured it. He knows it, I know it. ROY: I think once Jack left, there was a natural tendency to mentally downgrade his contributions… you don’t necessarily play up the guy who’s quit and gone to the competition. TJKC: A lot of people were really upset about Origins of Marvel Comics, because it seemed like Stan had really downplayed Jack’s contributions a lot there. So I tried to write these—knowing Jack would read them, I tried to write them to make it look as if he and I were just doing everything together, to make him feel good. And we were doing it together. But with something like Galactus, it was me who said, “I want to do a demigod. I want to call him Galactus.” Jack said it was a great idea, and he drew a wonderful one and he did a great job on it. But in writing the book, I wanted to make it look as if we did it together. So I said we were both thinking about it, and we came up with Galactus. In a series of essays on Steve Ditko in 2012, 20 Stephen Bissette assessed the state of public perception regarding the company and its creators. Let’s face it: Marvel and Stan Lee have controlled the mainstream dialogue about Marvel Comics since 1947 (and the article that year by Lee in Writer’s Digest). With the sole exception of [Dan Raviv’s] Comic Wars… every book about Marvel since Stan Lee’s Origins of Marvel Comics (1974) has been either a Marvel Comics and/or Stan Lee self-promotional confection. In fact, I’d date that love affair back to 1947, and the publication of Stan Lee’s chapbook The Secrets of Comics, which handily wrote Joe Simon and Jack Kirby out of the creation of Captain America (chalking it all up to publisher Martin Goodman). Why, oh why, continue to favor Stan Lee’s account, with so much self-evident conflict-of-interest as a benchmark of his entire comics and media career; so many conflicting self-accounts from Stan himself; and such a clear, public record of Stan’s profiting and profiteering for much of his life from sustaining and spinning his own self-aggrandizing accounts? Ditko is still in the process of telling his story in new essays, and Jack Kirby left us with a wealth of his thoughts and experiences in dozens of interviews over the decades (see the “Interviews” post). When researching the events to which only the three men were party, is it too much to ask for the facts to be checked against the sayings or writings of the two the least likely to have misled us, the two who stuck to their story from the start? 1974’s Origins was a company-directed retelling of the creation of the Marvel Universe, with some of the principals relegated to minor roles. As if to give credence to the ridiculous tales, an authentic-looking synopsis for FF #1 turned up. At John Byrne’s insistence that Marvel editor Roger Stern discovered the synopsis in Stan Lee’s old desk, Patrick Ford asked Stern about the desk. Stern said it was David Anthony Kraft who found the synopsis. 22 If this discovery took place in the early ’80s, why was the synopsis not mentioned until the late ’90s? …the veracity of this document has been called into question with such a degree that, as believable evidence, it appears to be about as genuine as Bob Kane’s 1934 sketches of Batman… Some claim that it’s not believable at all and are stunned if anyone, even Stan Lee, believes that this was written before Jack Kirby began to draw the first issue. Those who subscribe to that theory believe that it was written well after the event, possibly after the book was produced, perhaps in the 1970s or even the 1980s, in which event it’s not likely that Stan wrote this as a guide for Kirby to follow. It’s just too perfect to be true. You start out with a defensible aim… to show that Jack did more than he was paid for… and turn it into not much more than a more sophisticated form of Lee-bashing… What’s done on pp. 48-49 of CBC #1 is not far from the kind of statement Jack himself made, during the years when he had first left Marvel, when an interviewer tried to pin him down and ask him what Stan Lee did in those stories. “Stan Lee was my editor,” was all Jack would say. 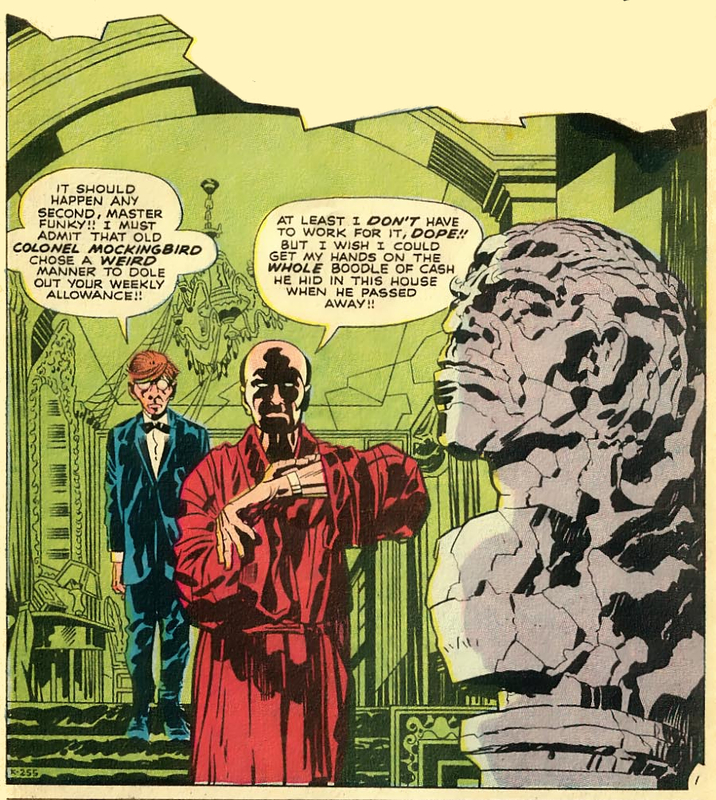 Jack, who of course was and remains even years after his demise one of the greatest artists in the history of the comic book medium, was given at that stage to delusions of grandeur that went far beyond even his massive talents and contributions… and your garbled characterization of the early Lee-Kirby work merely contributes to the fog. As he admits, Thomas was no more present during story conferences than was Cooke (only Lee and Kirby were). Cooke, who may not be a rank amateur analyst but sure behaves like one according to Thomas, shouldn’t be allowed to interpret the overwhelming evidence when Thomas’s take should be sufficient for anyone. Meanwhile it’s the rank professional historian who’s spewing fog: Thomas blindly supports the Lee version of events, knowing better than anyone the questionable reliability of its author. From his indefensible position, he joins Lee in making Kirby and others out to be the liars. Delusions of grandeur? It’s that grandeur that still provides the payroll, his portion of which allows Thomas to conveniently dismiss the truth while kicking dirt on Jack Kirby’s reputation. The light was made to dawn on Thomas as soon as the interview saw print: Marvel recognized the misstep and persuaded him the synopsis was authentic. As soon as it could be scheduled in Alter Ego, Thomas printed the document along with a rebuttal of his comment by Lee and company: yes of course it was written before discussion with Kirby. The AE synopsis exposé 26 reads like an ad taken out by Marvel’s lawyers touting Lee’s new, improved memory. In it, Thomas revealed he had initially seen the synopsis in Lee’s office, “late-1960s,” making the timing of even the initial discovery suspect. That would place it at the time Perfect Film & Chemical were looking for documentation to prove Kirby wasn’t involved in creation. From then on, Thomas never waffled on the pedigree of the synopsis. Roy: By Fantastic Four #1, you had developed what later came to be called “the Marvel style.” But you were doing this all along for some monster stories, some time before this. How far back does that go? Stan: You mean just doing synopses for the artists? Was I doing them before Marvel? Roy: I know that you did it for Fantastic Four. [Stan’s synopsis for F.F. #1 is printed in Alter Ego, Vol. 2, #2, backing this issue of CBA.] So I figured with Jack as the artist—and maybe Ditko, too—in these minor stories that you mostly wrote, along with Larry Lieber, you must have been doing it since the monster days. Stan: You know something, Roy? Now that you say it, that’s probably true; but I had never thought of that. I thought that I started it with the Fantastic Four, but you’re probably right. [ FF #1] feels an awful lot more like Jack’s earlier work than anything that Stan had done to that date. So I find it very difficult to believe that Jack did not have input into the creation of the characters prior to the – that synopsis, whenever it was composed. And, also, I have the fact that I talked to Stan many times, and he told me – and he said it in print in a few places – that he and Jack had sat down one day and figured out what the Fantastic Four would be. QUINN. And they discussed the plot before they actually – the drawings were done? A. They discussed the plot before the alleged synopsis was done also. I’ve never seen it, and of course I would say that’s an outright lie. Aside from the spot-on assessment of Lee’s dialogue and captions, Bails has got it wrong, presumably because his information came straight from Lee. Perhaps Lee was asked for a script, and he scrambled to improvise. He grabbed an issue he had on hand and performed a little reverse engineering to create the synopsis. It was an unfortunate choice. In Pure Images #2,31 Greg Theakston presented a transcription of the same synopsis, conspicuously missing the last page. He reserved comment while devoting a page of the article to comparing the last four panels of “Voodoo on Tenth Avenue” in Black Magic #4 (1951) to the nearly identical last three panels of Fantastic Four #8 (1962). Oops, Lee chose the wrong story to synopsize. Although it would be amusing to see how he would have outlined the plot on that “missing” last page, it’s safe to say he had no prior input into a story whose plot Kirby re-used from an eleven-year-old story in his own repertoire. The charitable view on the synopses is that Lee wrote them for his own reference after Kirby related each story to him. Skeptics, however, will insist they were a device manufactured sometime after the fact to “confirm” the details of a history rewritten. This cross-pollination of a character from one story, and a plot from another is classic Kirby. Kirby’s touches are repetitive and easily identifiable. It appears that Kirby did not cross match the Fly and the Shield one time; he did it twice, and both simultaneously. For Spider-Man, Kirby took the basic character traits (insect), and the villain (petty crook) from the Fly, and the origin gimmick (scientific, older teen), and the dramatic ending (mourning a lost friend) from the Shield. For Thor, Kirby reversed himself, taking the origin element, (finding of a mystical artifact) and ending, (transformation back to hapless human) from the Fly, and the villain (rampaging aliens) from the Shield, plus adding in a hero from an earlier DC fantasy story. (Tales of the Unexpected #16). Is this use of a Kirby plot, in a book not drawn by Kirby, unusual for Marvel at the time? No! Iron Man’s origin, from Tales Of Suspense #39, uses a Kirby plot, first seen in a Green Arrow story from 1959. (“The War That Never Ended”, Adventure Comics 255). Similarly, the origin of Dr. Strange is a reworking of the origin of Dr. Droom from Amazing Adventures #1. (Atlas Pub. June 1961). The idea that Kirby would plot the origin of a new character is the rule at Marvel in the early ’60s. It would actually be an anomaly if Kirby hadn’t provided the origin. But it doesn’t stop there, for while I was cross-referencing the plots to see if any matched up with AF #15, I noticed another striking coincidence, and this staggered me! Not only does it appear that Kirby provided the plot for AF #15, it appears that he also assisted in plotting some of the following Spidey stories. The second and third Spider-Man stories have plot elements taken directly from the second and third Private Strong stories. That’s correct; the first three Spidey stories mirror the first three Shield stories. What are the odds, if Kirby didn’t assist on the plots, that the first three Spider-Man stories would mirror the first three Shield stories? Wouldn’t one think that Stan Lee, and Steve Ditko would have their own plotting patterns? So it seems clear that Kirby’s participation with Spider-Man extended further than just a rejected proposal. It appears that he not only created the character, he also assisted greatly in the origin and early story lines and added many early plot elements. Again, is this out of character? No. Kirby helped Stan with the plotting of several characters even when not specifically drawing them. The plot to the origin of Iron Man, several of the early Thor stories, and some of the Torch stories from Strange Tales, not drawn by Kirby, have unmistakable Kirby supplied villains, plots, and dramatic elements. Daredevil showed some early Kirby involvement. Why wouldn’t Kirby assist Stan on Spider-Man? The early Marvel titles and characters were never considered private domains. Stan certainly had no compunction about Kirby doing the first 2 covers, or a back up story. Marvel had a modus operandi also. Evidence shows that Kirby helped out on just about every new project, even the ones he didn’t draw. You’ve seen them—Jack Kirby presentation pages for proposed titles. Examples have been published featuring Starman Zero from the ’40s; the New Gods in the ’60s; Kamandi, OMAC and Atlas from the ’70s at DC.34 Kirby’s concept page for Boomerang was printed in Tales to Astonish #81. Two ’60s Marvel presentation images (including one for the original Captain Victory) have been featured on covers of Jack Kirby Collector. Still others that no longer exist in presentation form may have been turned into covers (Iron Man’s debut, for instance, on Tales of Suspense #39) or Marvel Masterworks Posters. According to Susan and Neal Kirby, Jack worked on new character pages for the FF and Thor in the basement. FLEISCHER: Do you have any recollection of discussing with your father the work he was doing for Marvel? A. Yes. I was in his office a lot, because he had a vast library of books, because he was into everything. And I used to go down there and read, so I used to read his books, and stuff, and one day I was upstairs, and mom told me to go downstairs because Dad was creating some new super heroes. So I went downstairs, and he said, “I want you to see this.” He said, I named the female super hero after you, her name is Sue,” Sue Storm he was talking about, it was the Fantastic Four. Q. What did you say to him? What did he say to you? A. I said it looked great. There were three characters on the board, three of the four. And I asked about who they are, and he told me who each one was. And I said, “It looks great, they look great”. Q. Did your mother ever discuss with you any other characters that were published by Marvel that your father created or didn’t create? FLEISCHER What story were you talking about? A I believe it was when he was creating Thor. Q And what do you recall telling Lisa at that time about Thor, its creation? A Well, my father was always very interested, he loved mythology, he loved studying religion and history, just knew all about it, his bookshelves were just loaded with that kind of stuff, so as a kid I was always at that time more into history than I was science but we would have long discussions about it. But I kind of got into it, I guess you might say, on a more practical basis and I remember kind of standing by his drawing board as he was kind of doing the Thor character and he had the big, if I remember right, either Thor or one of the other characters that had big horns coming out of the helmet and I said a real Viking wouldn’t have big horns coming out of his helmet and we were laughing and that was about it. I think my father kind of laughed and made some statement that well, this isn’t, you know, Viking reality, it is a visual impact, so he gave me a little art lesson there. Q And how did you, what is the basis for your belief that it was the first? A I recall his – we were – we were talking about the – about Thor’s costume and he was doing it for the first time and, again, there were other things. I think I had made some comment about the big circles on the front of the character and, you know, again my father was, you know, jokingly, jokingly referring to visual impact other than possible reality of what a true Viking might have worn. Q What led you to believe it was the first drawing your father was doing concerning the Thor? MR. TOBEROFF: Asked and answered. A Again, the same thing. The basic creation of the costume. Q Did your father tell you that this was the first drawing he was making of Thor? A He did refer to doing a new character, yes. Q And was it the Thor character or some other character that became part of the Thor comic book? A No, it was the Thor character. Q And your recollection is that part of the costume that he was creating had a helmet with horns? Despite Judge McMahon’s contention that teenagers shouldn’t have a say in court, the recollections of Susan and Neal Kirby, along with Shooter’s, indicate that Kirby gave to Lee (at a minimum) presentation pieces for the Fantastic Four, Thor, Iron Man and Spider-Man. The Heritage Auctions website provides a great resource for examining comic art at high resolution. Forensic examination of these yields clues about Kirby’s workflow during specific periods of his work. On a Tales of Suspense #28 page, penciled by Kirby and inked by Russ Heath, Kirby’s penciled lettering is visible in the balloons. 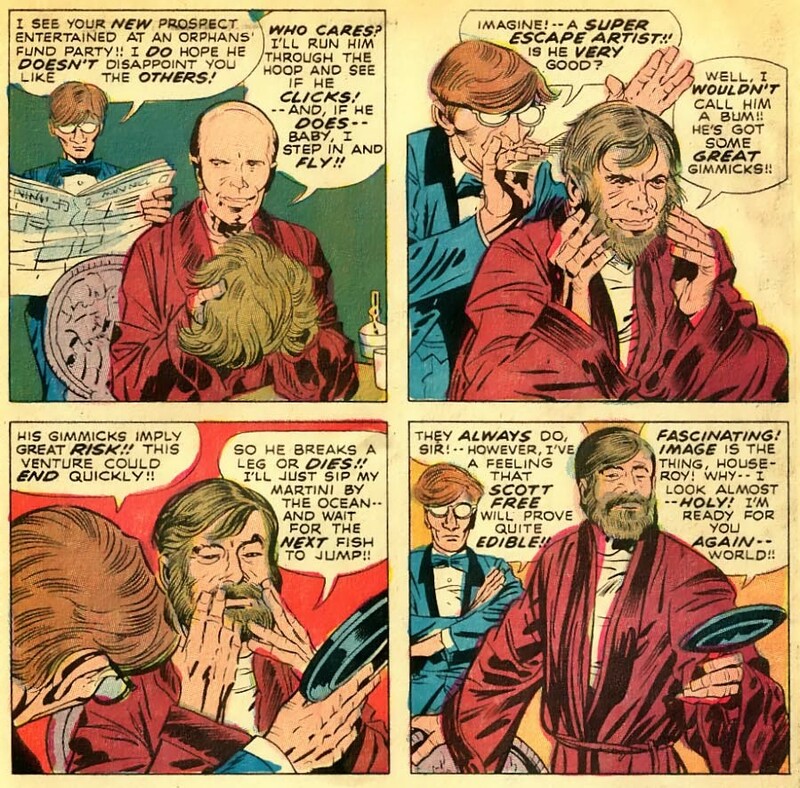 This often indicates that Kirby wrote the story, since Lee has stated that according to the Marvel Method, his dialogue and captions were added after he received the penciled pages. Pages from X-Men #5 (1963), penciled by Kirby, inked by Paul Reinman, have Stan Lee margin notes. Does this prove that Lee wrote the plot on Kirby’s art board before the penciling stage? Of course not… Marvel did not supply Kirby’s materials; as a freelancer he supplied his own. Lee’s margin notes could only have been added during the story conference, confirming Kirby’s version of events that he finished the story, then told Lee what was happening. In 1959, concurrent with his output on monster, western and romance stories, Kirby was assigned a number of interesting war stories. Based on a reading of many early stories, it appears that Kirby also scripted many early stories, especially pre 1960 (an examination of his possible scripts on other genre stories will appear at a later date). There are many similarities in style, tone, emphasis of words, phrases, use of quotation marks and sound effects that point to Kirby’s input. About this synopsis: one thing that always bothered me was that stories weren’t done in chapters by Lee until Kirby came along and incorporated them in the monster stories. Jack was doing stories this way for years. I could be wrong of course, but if Lee wrote the synopsis without input from Jack, why would he break it down into chapters ala Kirby? To me this is a telling example that, if the synopsis is real, then Lee must have worked out the plot with Kirby, because the story is broken down the way Jack would do it. In my opinion if Kirby didn’t have any input, as Lee attests, then the synopsis was typed after the story was drawn; as Jack attests! Repetition for citations allows linking back to individual quotes. back 1 Charles Hatfield, Hand of Fire: The Comics Art of Jack Kirby. University Press of Mississippi, 2012.
back 2 Charles Hatfield, Hand of Fire: The Comics Art of Jack Kirby. University Press of Mississippi, 2012.
back 3 John Morrow, “Ghost Writing,” The Jack Kirby Collector #62, Winter 2013.
back 4 Jack Kirby interviewed by Gary Groth, conducted in summer of 1989, The Comics Journal #134, February 1990.
back 5 Brian Hiatt, “Stan Lee on the Incredible Hulk’s Path to ‘Age of Ultron’: Marvel Comics legend and writer/Ultron creator Roy Thomas offer history lessons on heroes and villains,” rollingstone.com, April 29, 2015.
back 6 Stan Lee, Origins of Marvel Comics, Simon and Schuster, New York, 1974.
back 7 Stan Lee deposition, 13 May 2010, Justia, Dockets & Filings, Second Circuit, New York, New York Southern District Court, Marvel Worldwide, Inc. et al v. Kirby et al, Filing 102, Exhibit I, and 8 December 2010, Justia, Dockets & Filings, Second Circuit, New York, New York Southern District Court, Marvel Worldwide, Inc. et al v. Kirby et al, Filing 102, Exhibit J.
back 8 Jerry Bails, “We the Undersigned,” The Comics Journal #105, February 1986.
back 9 Roy Thomas interviewed by Jim Amash, conducted by phone in September 1997, published in The Jack Kirby Collector #18, January 1998.
back 10 Stan Lee, letter to Jerry Bails, 1/9/63, Justia, Dockets & Filings, Second Circuit, New York, New York Southern District Court, Marvel Worldwide, Inc. et al v. Kirby et al, Filing 65, Exhibit 27.
back 13 Stan Lee interviewed by Neil Conan, WBAI radio, 12 August 1968.
back 14 “Stan the Man & Roy the Boy,” A Conversation Between Stan Lee and Roy Thomas, Comic Book Artist #2, Summer 1998.
back 15 Steve Ditko, “Essay #34: Memory,” The Four-Page Series #5, February 2014. Published and © by Robin Snyder and Steve Ditko. back 16 Mark Borax interview, Comics Interview #41, 1986.
back 17 Stan Lee, Origins of Marvel Comics, Simon and Schuster, New York, 1974.
back 18 Roy Thomas interviewed by Jim Amash, conducted by phone in September 1997, published The Jack Kirby Collector #18, January 1998.
back 19 Stan Lee deposition, 13 May 2010, Justia, Dockets & Filings, Second Circuit, New York, New York Southern District Court, Marvel Worldwide, Inc. et al v. Kirby et al, Filing 102, Exhibit I, and 8 December 2010, Justia, Dockets & Filings, Second Circuit, New York, New York Southern District Court, Marvel Worldwide, Inc. et al v. Kirby et al, Filing 102, Exhibit J.
back 20 Stephen Bissette, “Digging Ditko, Part 3,” SRBissette.com, September 14th, 2012.
back 21 Stephen Bissette, “Digging Ditko, Part 3,” SRBissette.com, September 14th, 2012.
back 22 “Stan Lee’s Fantastic Four synopsis,” Byrne Robotics: The John Byrne Forum, 19 October 2008; “Roger Stern’s Superman (and more!) on Kindle,” DC Archives Message Board Forum, 24 May 2013.
back 23 Daniel Best, “Marvel Worldwide, Inc. et al v. Kirby et al – Stan Lee’s FF #1 Synopsis & Jerry Bails,” 20th Century Danny Boy blog, 10 April 2011.
back 24 Roy Thomas, Letter to the editor, Comic Book Creator #3, Fall 2013.
back 25 Roy Thomas interviewed by Jim Amash, conducted by phone in September 1997, published The Jack Kirby Collector #18, January 1998.
back 26 Roy Thomas, “A Fantastic First!,” Alter Ego Vol. 2, #2, Summer 1998.
back 27 “Stan the Man & Roy the Boy,” A Conversation Between Stan Lee and Roy Thomas, Comic Book Artist #2, Summer 1998.
back 28 Mark Evanier deposition, 9 November 2010, Justia, Dockets & Filings, Second Circuit, New York, New York Southern District Court, Marvel Worldwide, Inc. et al v. Kirby et al, Filing 65, Exhibit 8.
back 29 Jack Kirby interviewed by Gary Groth, conducted in summer of 1989, The Comics Journal #134, February 1990.
back 30 Jerry Bails, “Agent X-ASOCTCRASIDCIWWS Reporting,” K-A CAPA-alpha #2, November 1964.
back 31 Greg Theakston, “The Birth of Marvel Comics,” Pure Images #2, Pure Imagination, January 1990.
back 32 Stan Taylor, “Spider-Man: The Case for Kirby,” 2003. Posted on The Kirby Effect: The Journal of the Jack Kirby Museum & Research Center. back 33 Stan Taylor, “Spider-Man: The Case for Kirby,” 2003. Posted on The Kirby Effect: The Journal of the Jack Kirby Museum & Research Center. back 34 Starman Zero and OMAC presentation pages, Kirby Unleashed, TwoMorrows Publishing, 2004. Boomerang, Jack Kirby Collector #13.
back 35 Susan Kirby deposition, 25 October 2010, Justia, Dockets & Filings, Second Circuit, New York, New York Southern District Court, Marvel Worldwide, Inc. et al v. Kirby et al, Filing 102, Exhibit H.
back 36 Neal Kirby deposition, 30 June 2010, Justia, Dockets & Filings, Second Circuit, New York, New York Southern District Court, Marvel Worldwide, Inc. et al v. Kirby et al, Filing 102, Exhibit G.
back 37 Jim Shooter, Writer. Creator. Large mammal. blog, Monday, March 21, 2011, and comment on Wednesday, March 30, 2011 post, left August 30, 2011.
back 38 Kurt Busiek, “Don Heck interview,” kirbyville (Internet mailing list), 28 November 2010.
back 39 Michael Vassallo, Kirby-L, the Jack Kirby Internet mailing list, 18 November 1999.
back 40 Nick Caputo, “More Kirby War: Battle,” Marvel Mysteries and Comics Minutiae blog, 30 November 2012.
back 41 Mike Gartland, in a comment to the Kirby Dynamics blog. Included by Robert Steibel in “My Interview Questions for Stan Lee Part 3: Chapter Breaks,” Kirby Dynamics blog, Jack Kirby Museum & Research Center, April 7, 2012.